to take you away LOL! 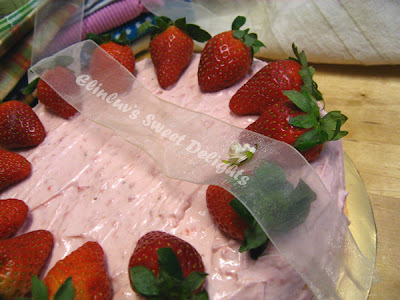 Today is Claire's birthday and I baked this delicious and healthy cake for her yesterday. Actually , I was still on medical leave :p but the passion to bake is so strong. Buying her a cake is an insult to myself :p since I can bake one that has a personal touch to it. 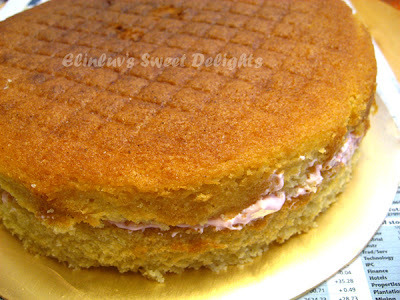 I took this light and yet moist butter cake from Rima's blog Do drop by her beautiful and inspiring blog for more inspirations. Claire's favorite cake is butter cake and I purposely chose this healthier version for her. Splash on with a frosting that is finger licking good...refreshing and topped with fresh strawberries that will have her eyes squinting shut...mmmmmm yummy ! 8. Bake for about 40 minutes, or until it a skewer comes out clean. 9. Leave to rest in pan for 5 minutes before serving. Whisk the cream with icing sugar till light and fluffy, add in the heavy cream and strawberry puree and leave in the fridge for 30 minutes before use. 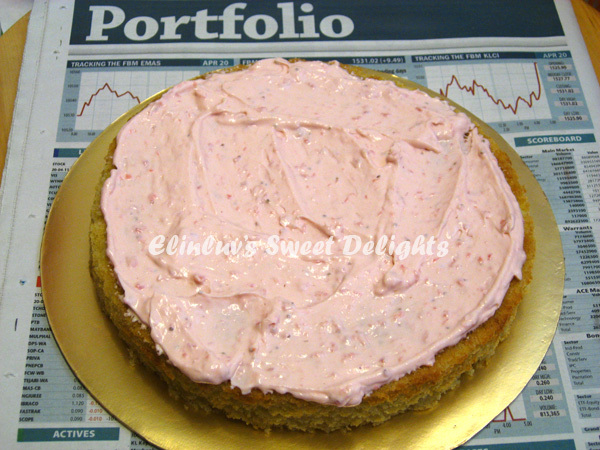 Make sure the cake is completely cooled before applying the frosting. So sweet of you to bake a birthday cake for Claire. 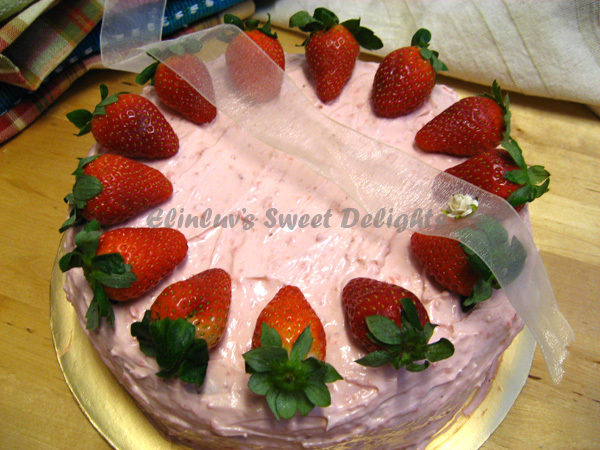 Elin, you are so thoughtful bake a birthday cake for Claire...hope she get well soon. GOSH..OH MY!!! 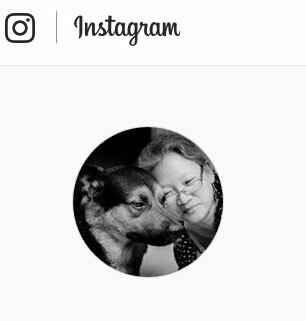 ELIN.. MY LOVE! 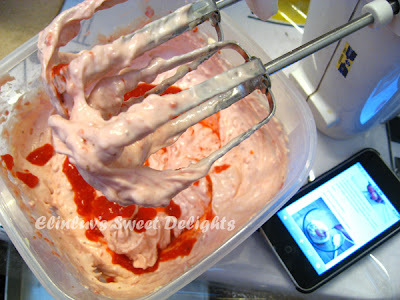 I am so touched.. baking this cake i so so complicated to me! 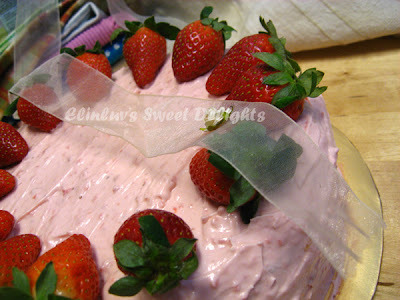 It is still in my fridge and tonight I will make sure that one bite on it will remind me of your passion in baking this! Thank you once again, Elin.. so so much! 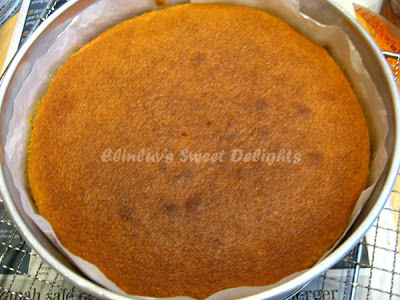 i have never bake a butter cake with so even surface, yours look so even..must try this recipe soon. Thanks for sharing. GOSH! This is awesome. Elin, you've done a good job! This birthday cake looks very pretty and healthy. A BIG shout from me to Claire: HAPPY BIRTHDAY TO YOU!!! 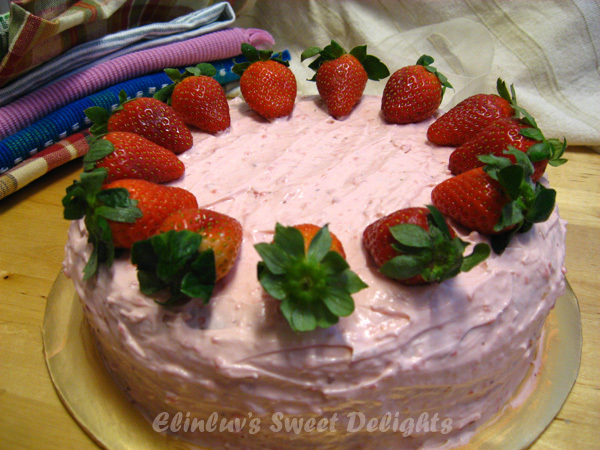 elin, you're really so thoughtful baking a cake for claire even though you're not well, can even whipped up such a beautiful cake! You're the best!! It's so heartfelt to have agood buddy baking a birthday cake for oneself. Claire's so blessed to have you as her friend. May God bless your generosity and the fellowship between you two. oh Elin, that cakes looks so very very good! 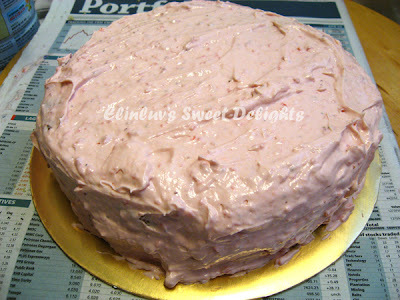 You can just see how strawberry-licious that frosting is, and your cake looks so moist and tender! Thanks for sharing your creation with us today....hope all is well in your corner of the world! What a beautiful cake! 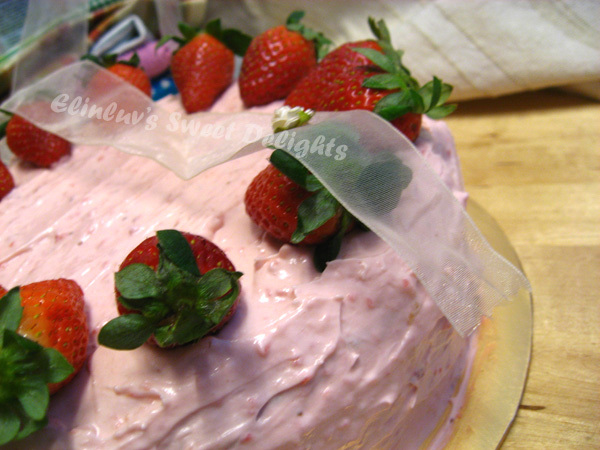 Strawberry is so elegant and so under used in baked goods! Thanks for sharing! Welkome to ffwd and your nice comment. i love your strawberry cake. I just let my oldest son see the pictures of the cake and he wants one too. It looks terrific. Your cake looks excellent! I love butter cake, this looks like a great recipe! I love butter cakes because you can enhance the flavor in so many ways. The splash of cognac is a nice addition. Elin, the recipe include cognac but I am wondering is it I should mix it together with milk?